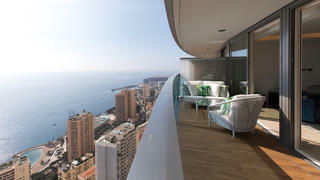 Odeon Tower, Monaco's newest luxury apartment block and home to the world's most expensive apartment, is now open and offering plenty of properties as luxurious as your superyacht. Of course, once you've found your perfect home you need to make sure it has a suitably elegant interior and Sabrina Monteleone of Sabrina Monte-Carlo — a design firm with a wealth of experience in superyacht and private jet interiors — is the ideal choice. Here she takes us on a tour and explains the design rationale behind her Odeon Tower show apartment. The Living Room The starting point when choosing the decoration was the existing marble floor, enhanced by touches of grey, bronze and blue, which were all designed by Pinto Paris. Using blue was an obvious choice for this apartment because of its breathtaking views over the Mediterranean Sea and the cloudless blue sky of Monaco. Blue is the colour of the Cote d’Azur, of the bright, long summer days and it blends well with nearly every other colour. Two beautiful velvet armchairs, a beige nubuck sofa and round and square dark wooden tables are all positioned on a beige wool carpet, which is tone on tone with the marble floor. This creates an elegant continuation of the dining room and visually enlarges the already vast room. The living room is designed to enhance the calm, peaceful feeling of the apartment, thus bringing a reassuring sensation to visitors. The neutral colours are based on those often found on board yachts which make small areas look larger and more welcoming. 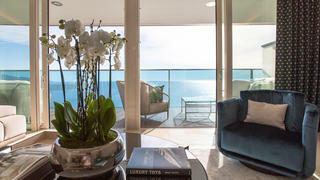 Odeon Tower, Monaco's newest luxury apartment block and home to the world's most expensive apartment, is now open and offering plenty of properties as luxurious as your superyacht. Of course, once you've found your perfect home you need to make sure it has a suitably elegant interior and Sabrina Monteleone of Sabrina Monte-Carlo — a design firm with a wealth of experience in superyacht and private jet interiors — is the ideal choice. Here she takes us on a tour and explains the design rationale behind her Odeon Tower show apartment. The starting point when choosing the decoration was the existing marble floor, enhanced by touches of grey, bronze and blue, which were all designed by Pinto Paris. Using blue was an obvious choice for this apartment because of its breathtaking views over the Mediterranean Sea and the cloudless blue sky of Monaco. Blue is the colour of the Cote d’Azur, of the bright, long summer days and it blends well with nearly every other colour. Two beautiful velvet armchairs, a beige nubuck sofa and round and square dark wooden tables are all positioned on a beige wool carpet, which is tone on tone with the marble floor. This creates an elegant continuation of the dining room and visually enlarges the already vast room. The living room is designed to enhance the calm, peaceful feeling of the apartment, thus bringing a reassuring sensation to visitors. The neutral colours are based on those often found on board yachts which make small areas look larger and more welcoming. Here too, blue is on the menu. The deep blue velvet Fendi dining chairs bring a modern touch and an original tone to the neutral beige leather table top. 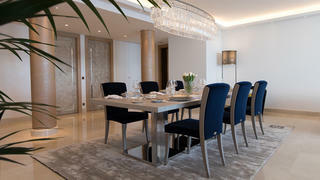 The frame of the chairs match the thick grey wool Fendi carpet which we placed under the table. I love mixing materials such as leather, fur, crystal and velvet — all these different textures make spaces appear both interesting and luxurious. 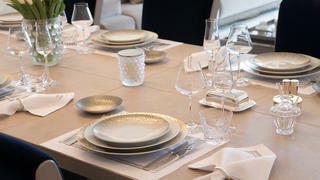 Tableware is another area of expertise for Sabrina Monte-Carlo. A well-prepared table can enhance even the most casual of dinners and this is particularly true when choosing dinner services and glassware. For instance, Haviland hand-painted plates serve to highlight the skill behind carefully prepared dishes, and rare wines in delicate St Louis crystal glasses always taste better. Velvet creates a cosy and relaxing effect in any room but wrapped around a bedhead it truly invites sweet dreams. A few fluffy and silk satin cushions, as well as a hint of fur, bring a soft, warm note to cold winter days. A shimmering grey hue has been used as a backdrop throughout the apartment to soften the atmosphere, so for the bedroom we choose accessories in metallic tints of silver and gold bring a little more colour and warmth to the room. For the outdoor areas, we opted for a ‘tropical winter garden’ theme on the three beautiful terraces to create a casual summer feel and encourage relaxation in the sun. The white Fendi furniture features colourful jungle patterned cushions that give a holiday feeling to the panoramic ocean views. When the views are as exceptional as this, there is no need for eye-catching colourful pieces! Sabrina Monte-Carlo now offers five showrooms, in Monaco, Saint-Jean-Cap-Ferrat and Courchevel, displaying a large, yet refined, selection of furniture, fabrics and decorative pieces from the most prestigious manufacturers. Visit sabrinamontecarlo.com. For the outdoor areas, we opted for a ‘tropical winter garden’ theme on the three beautiful terraces to create a casual summer feel and encourage relaxation in the sun. The white Fendi furniture features colourful jungle patterned cushions that give a holiday feeling to the panoramic ocean views. When the views are as exceptional as this, there is no need for eye-catching colourful pieces! Sabrina Monte-Carlo now offers five showrooms, in Monaco, Saint-Jean-Cap-Ferrat and Courchevel, displaying a large, yet refined, selection of furniture, fabrics and decorative pieces from the most prestigious manufacturers. Visit sabrinamontecarlo.com.